Video Poker Jackpot! 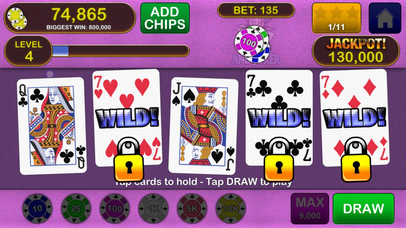 brings exciting Vegas Casino style Video Poker to your fingertips anytime anywhere! The games are easy to learn, simple to navigate and most importantly, hours of fun! Simply select a game of your choice, choose a bet and start drawing cards! — FREE FREE FREE! — Keep the chips flowing with FREE Bonus Chips multiple times a day! — HIT THE JACKPOT! — Win up to 1 MILLION FREE Chips every for hitting the Jackpot! — UNIQUE MACHINES — Play Joker Poker, Jacks or Better, Deuces Wild!, High Stakes, and Bonus Poker. Many more games to come! — BIG BIG BIG CARDS — Large, vibrant cards optimized for your eyes on both your iPhone and iPad! — UNLOCK ACHIEVEMENTS — Discover even more gameplay as you complete achievements through the game.